The Inn of Nectar/Kokopelli Suite is a family vacation house located between Santa Fe (20 minutes) and Taos (45 minutes) on a hill overlooking the beautiful Espanola Valley of the Rio Grande. There are terrific views of the valley, and two mountain ranges from our hilltop gazebo, outside hot tub, and your rooms. For more photos of the houses go to santafegetaway on the web. We are close to shopping and activities such as golf, yet we are also on five naturally landscaped acres in a peaceful setting. We especially welcome families with or without children. In the area are Indian ruins, whitewater rafting, hot springs, art galleries, the Santa Fe Opera, Flea Market, Sanctuario de Chimayo, Bandelier National Monument, Pueblos, casinos, and other activities. 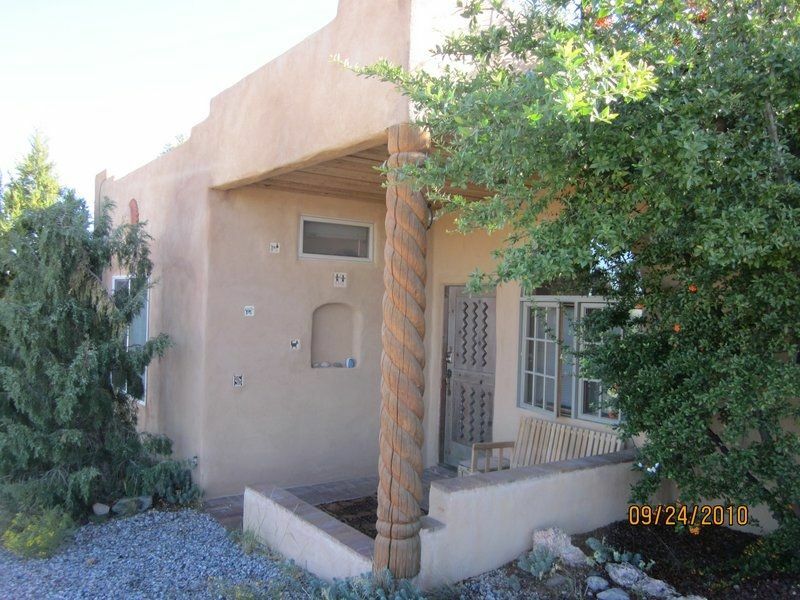 The Non-Smoking house is built in charming, southwestern-style with vigas and satillo tile floors. We are a great setting for those seeking a spa-like vacation. We can provide natural meals, yoga, meditation, and massage. Nearby are several hot springs as well as our own state of the art hot tub. It also can be rented with the attached Kokopelli Suite which makes it a 3 bedroom, 2 bath house with 2 tv's and an extra small kitchenette.Perfect if you want a little more distance from the kids or have grandparents along. Though you don't have to go outide to go from one to the other. We also rent out our own larger house, Amrit Nivas, which sleeps 10+. Hope to see you soon. The Inn (of Nectar) was immaculate, the house's beauty rivaled that of its location, and hot tubbing under the stars away from the city lights was gorgeous. The house felt like a home away from home, though it was much nicer and larger than our own home, lol. We felt very comfortable and very safe, and even our dog appreciated the accommodations and the freedom PS gave us to wander about. Needless to say, we will be recommending this spot to any friends and family headed to the Santa Fe/Taos area. Also, PS gave us some great recommendations on places to eat and see. He told us about the Santuario in Chimayo and a little restaurant near it called Leona's. That was the best New Mexican food we had all weekend! We also went to some hot springs northwest of Taos that he recommended, but we ended up going to Blackrock instead of Stagecoach. The hot springs were nice and hot, and the view of the river within the gorge was breathtaking! What a nice place to stay; great views, quiet and very accommodating owners. Wish I had more time to visit this unique place. This was my 2nd stay at this property and the home and grounds are a real treat! Very attractive with lots of unique art. The home is well decorated and very quiet. The 360 degree view from the top of the hill (a short walk) is breathtaking, especially at sunrise and sunset! There are nice easy walking trails and lots to see nearby. The owner was also very helpful and informative. A great place to relax, read and meditate! You won't be disappointed. One bedroom or two bedroom options are also available. Please inquire.